(CNN) -- Rubens Barrichello has been reassured by Brawn GP that there is no hidden agenda to give priority to world championship leader Jenson Button as the team bids to extend its flying start to the Formula One season. 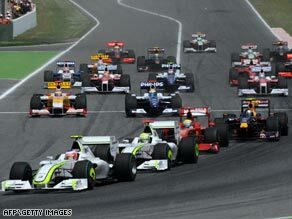 Barrichello leads pole-sitter Button into the first corner in Barcelona where he was runner-up to his team-mate. Brazilian Barrichello was forced to play second fiddle to Michael Schumacher at Ferrari and said he would quit should he "get a whiff of team orders" at Brawn after finishing runner-up at Sunday's Spanish Grand Prix. "I'm very experienced and...I won't follow any team orders any more. I'm making it clear now so everybody knows," Barrichello told media after Brawn switched winner Button to a two-stop strategy during the race. The 36-year-old Barrichello had taken pole-sitter Button from third on the grid on the run down to the first corner at Barcelona's Circuit de Catalunya and believed he should have gone on to win. "Rubens' unhappiness is natural," said team chief Ross Brawn. "But then any driver who gets beaten and is happy is not a driver I want in the team. "So the fact Rubens is unhappy is a healthy sign because I would see it as very strange if he was quite content to finish second behind Jenson." Button has now triumphed in four of this year's five grands prix to lead Barrichello by 14 points in the standings with the next race at Monaco on May 24. "I think Rubens has had a little bit of bad luck, and I know luck shouldn't come into it," Brawn told PA Sport. "In China he was looking very strong. In fact for a dry race he was in better shape than Jenson. "But then in the wet he had a problem with the brakes. One of them glazed over on the rear which made life very interesting for him. "In qualifying in Bahrain, when we'd gone for a pretty aggressive strategy which meant being at the front, he didn't achieve it as he had a problem with his front-wing. "But I'm pleased with Rubens' performance this year. He's contributed an awful lot to the team, helping sort the car out. "He gives very valuable technical information, and I think it just hasn't quite fallen for him this season. "Jenson's doing a superb job, so that's the reference, but I'm very happy with Rubens, and I'm sure if we get a smooth weekend he'll be up there." Briton Button echoed Brawn's comments, saying: "We're all here to win. It went my way (in Spain) and it may go his (Barrichello's) way in Monaco. That's the way it is. "He had a problem on his stint, I didn't. I made it work and I won the race, but then it could swing around at the next one. "That's the way we go racing, the way it should be, and the way it has been for most teams in Formula One. "I don't ever want to go down that avenue of talking about that (team orders) because it is so far from the situation within our team."